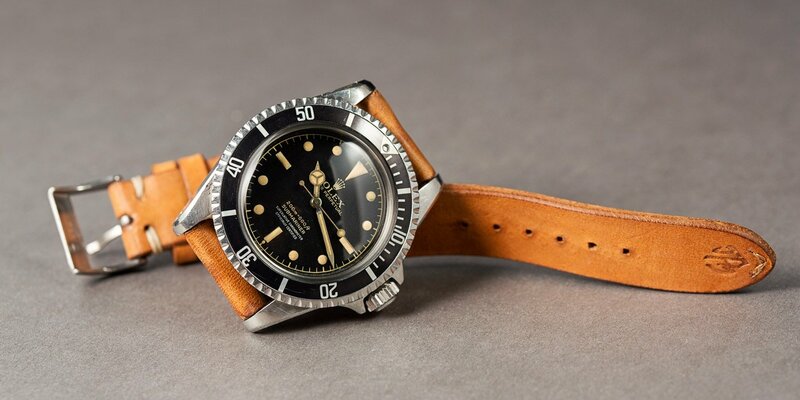 The 50’s was a vital decade for Rolex. It was the era where the brand doubled-down on their own concept of the tool watch, bringing us models such as the GMT-Master, to help transatlantic pilots cope with crossing different time zones, and the Milgauss, to equip the world’s scientists and engineers with a reliable timepiece that could withstand exposure to electromagnetic fields. The Submariner ref 5512 is a vintage watch that should be in every collector’s watch box. But the series that most readily springs to mind when you think of Rolex in the 50’s will always be the Submariner. Launched in 1953, by the end of the decade it was already into its ninth reference, with several of the earliest models having overlapping production runs, sometimes lasting for less than a year and yielding tiny quantities. It was a period of relentless testing, evaluating and incremental evolutionary steps, with upgrades both minimal and major, as Rolex strived to create the ultimate dive watch. By 1959, the net result of those turbulent formative years was a Sub that had come of age. The Rolex Submariner ref. 5512 was built on the backs of its predecessors, a watch that retained all the elements that worked, discarded those that didn’t and introduced the definitive shape for every subsequent iteration. Universally adored in vintage collector circles, it is thought of as the last of the ‘pure’ Submariners, a rare beast with even rarer variants dotted throughout its 20-year lifetime. While finding a worthy pre-owned example is becoming an increasingly difficult and expensive pastime, the ref. 5512 Submariner represents one of the most rock solid investments in the horology world. Below, we’ll take a look at just what makes it so special. The Submariner ref 5512 continues to be a great investment. Even though it was a leap forward in design, the ref. 5512 still wasn’t quite perfected when it was launched. The most obvious key difference between it and its forerunners was the addition of crown guards, protective shoulders around the winding crown to insulate it against shocks—a logical and welcome addition for a tool watch meant to accompany explorers on their underwater adventures. However, the square shape of the guards on the very first wave of the Sub, (and by very first, we mean the initial run of roughly 100 or so pieces), blocked the crown so much that it made it difficult to wind. They were quickly changed to a more pointed style that became known as ‘El Cornino’ for their resemblance to a set of horns. 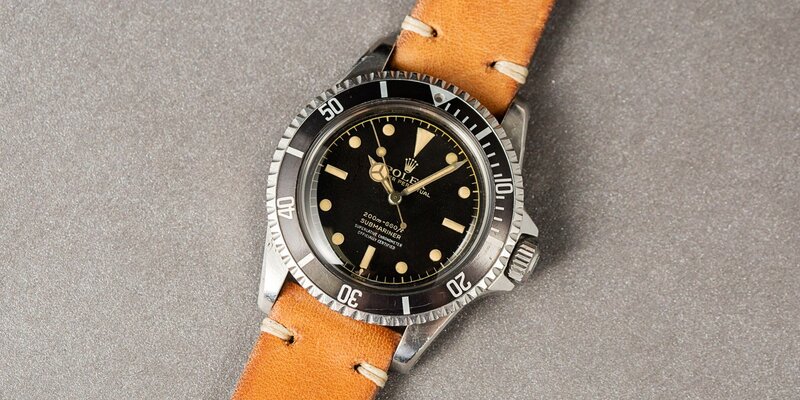 Interestingly, the surplus stock of those original cases Rolex had already manufactured were shipped across to their sister company Tudor, who used them on their own Submariner, the ref. 7928. Today, the square crown guard versions of the watch from both houses are the rarest and most valuable on the vintage market. Always advancing, the El Cornino guards were themselves replaced in the mid 60s for the softly rounded style we are more used to seeing today. Keep a close eye on the crown guards. Strangely, the special place the ref. 5512 holds in collector’s affections is more down to what it is missing rather than what it contains. It and its close sibling the Rolex Submariner ref. 5513 (more on that later) are the last of the classic acryllic crystal Subs to be offered without a date function and, more importantly, without the Cyclops lens. Rolex had introduced the Cyclops around the same time as the first Submariner’s debut, and it served a successful trial on the Datejust before being rolled out across the majority of the brand’s offerings. But it wasn’t until 1967 that it appeared on the Submariner range when the ref. 1680 emerged, and horrifed many of the faithful. The Sub’s austere dial symmetry was one of its main selling points, an element lost with the inclusion of a magnified window at 3 o’clock. The usefulness of including a date function on a dive watch in the first place was another argument vocalized at the time, which ignored the fact that the vast majority of wearers went nowhere near the water. But, hate it or love it, the Cyclops was staying, which only made the beautifully balanced proportions of the ref. 5512 even more appealing. What do you like about the Submariner ref 5512? Comment below. As with any classic Rolex, the tiniest change on the dial or bezel can lead to incredible premiums being added to their value. Without diving into the bottomless minutiae of every different type of font serif, text alignment, chapter ring, or whether the depth rating is written in meters or feet first, there are two main generations of ref. 5512 to look at, and even that is confusing enough. The very earliest examples of the watch were fitted with Rolex’s own Cal. 1530, a sturdy workhorse of a caliber, but one that was not, generally speaking, chronometer certified. To gain the certification, the movement would have to pass the stringent trials of the COSC, or the Official Swiss Chronometer Testing Institute. Only those proving accurate to within +4/-6 seconds a day could bear the label SUPERLATIVE CHRONOMETER OFFICIALLY CERTIFIED on their dials. With those early models of the ref. 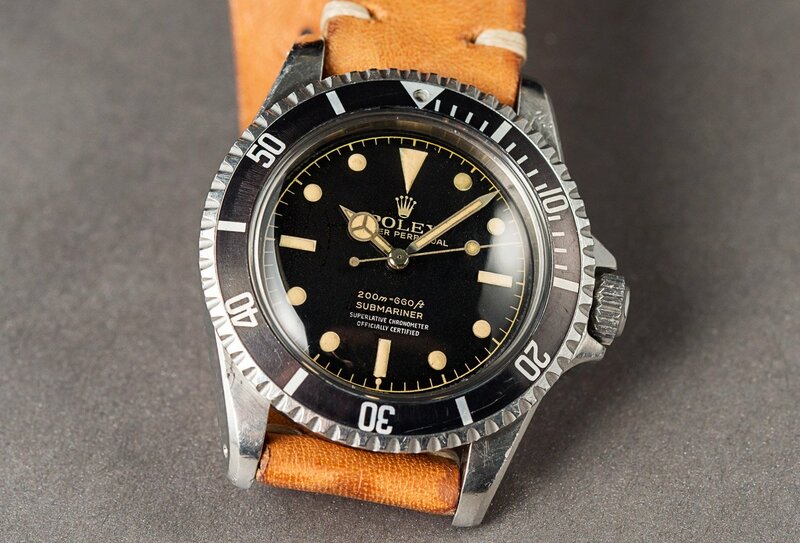 5512 not passing, or more likely, not being submitted for testing, the only dial text they had other than ‘Rolex’ and ‘Oyster Perpetual’ were the Submariner name and the waterproofness; 200m—660ft. These ultra rare pieces are known as the 2-line Submariners. The Cal. 1530 was very quickly replaced with the chronometer certified Cal. 1560, and a little later by the Cal. 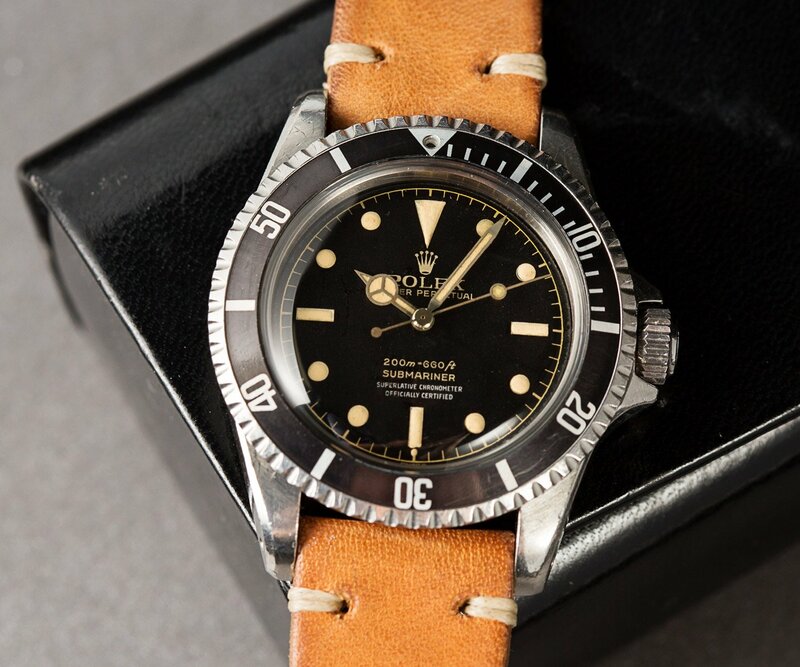 1570, which enabled Rolex to include the extra wording and created the, you guessed it, 4-line Submariners. So far, so good. But in 1962, the ref. 5513 Submariner was launched. Ostensibly identical to the 5512 on the outside, it was only ever fitted with non-chronometer certified movements—either a Cal. 1520 or 1530. That means that every one of the ref. 5513s had a 2-line dial. Though that may not seem too important, it is a detail that has caught out many a collector at the hands of an unscrupulous dealer. Because the ref. 5513 wasn’t a chronometer, it was considerably cheaper to buy than the 5512 and it had a far longer production run, not being discontinued until 1989. So to the untrained eye, the relatively plentiful and inexpensive 5513 is almost indistinguishable from the extremely scarce and highly valuable 2-line 5512. If you are in the market for one, always do your research on both the watch and the seller. The Rolex Submariner is the most counterfeited timepiece and the most emulated design in history. Not only are there more fake versions in circulation than the real thing, other manufacturers have adopted its styling cues into their own lines, creating homages to the world’s favorite dive watch. After several early years of shaping its foundation, the ref. 5512 was the real breakthrough, the moment when all the hard work and heavy lifting came together and formed the icon as we know it today. Its no date simplicity and minimalist layout are the true essence of Rolex—tough, honest and elegant, and it will always be the model die-hard collectors yearn for.